Have you done any aerodynamic modifications to lower the drag, and if so, what sort of results have you seen? In particular, things like smooth and flat wheel covers, a smooth belly pan (full or partial), adding a Kamm back, adding rear wheel skirts, or swapping out the wiper blades with the low profile blades. If you are more adventurous, you could install video mirrors in place of the side view optical mirrors. The benefits of these sorts of modifications will be longer range - and if you learn to coast farther with your lower drag car, then you can get a lot more range. I don't really believe mentioned mods would help to extend range for more then 5% when driving slow. If you estimate financial benefit, all costs of modifications would perhaps never return.... and the car would look ridiculous. If you really want to do something to extend range, you need range extender, like this one. It's in real life testing phase now. Where can we get more information on that battery range extender? Zelenec wrote: I don't really believe mentioned mods would help to extend range for more then 5% when driving slow. If you estimate financial benefit, all costs of modifications would perhaps never return.... and the car would look ridiculous. For us, the car is an around town grocery-getter. It has a horrible Cd because it's practical for what it was designed to do, and it's utility is worth 5% or even 10% off the maximum range to me any day - We hauled about 250 pounds of landscaping stones home in it from Lowes yesterday. Forget the 'range extending' Cd mods . . . . gimme a trailer hitch!! Even at 28-30MPH about HALF the load on the drivetrain is from aerodynamic drag. And that is why lowering the drag will extend the range. You get much more from the car you have by modifying it. All the mods I mentioned are small money, except the video mirrors. Don't knock it until you've tried it. Love the idea of that battery pack, but I do not usually drive more than 20 miles per day, so it would be a waste to carry around that extra weight. It would be nice to have on days when I need it though. NeilBlanchard wrote: You get much more from the car you have by modifying it. All the mods I mentioned are small money, except the video mirrors. Don't knock it until you've tried it. Neil, would you be able to quantify "much more"? If we're talking a 50% or more increase in range, then you've got my attention. But it also depends on what we have to do to extend our range that much. The problem is that to really extend your range in any significant manner, you have to incorporate several of the mods you mention. If there were one or two mods that could be performed quickly, easily, at low cost, AND significantly extend range, more people would probably be willing to look into them. Unfortunately, most of the mods I have read about only have a minimal impact on mileage. So you have to incorporate several of them to start seeing any noticeable benefit. And as was mentioned earlier, most of them make your car look plain silly! A lot of these mods, therefore, are only pursued by tinkerers who get geeked out over a 3-5% increase in range. Or hypermilers who are obsessed with eeking out a couple more miles per charge. Like I said, I would gladly perform mods to my car if they were easy, low cost, and didn't make my car look like a Frankenstein-monster spaceship! I'm fine with adjusting tire pressure, coasting in neutral, adjusting my driving style for slower, smoother acceleration/deceleration, etc. Heck, I would even change my windshield wipers if it makes any difference. However, I'm not likely to add rear wheel skirts, a Kamm back, a belly pan, or replace my side-view mirrors with video cameras (is that even legal?). And I'm certainly not going to drive at half the posted speed limit. I would get killed around here if I did that! So, are there one or two mods (or even three) that I can perform that won't make me look like a nerd, won't get me beaten up, won't cause traffic jams, won't cost an arm and a leg, are easy to implement, AND will result in TRULY SIGNIFICANT range extension? If so, sign me up! I've already increased my tire pressure and have adjusted my driving style (well, except for driving ungodly slow all the time). What else is there? NeilBlanchard wrote: Even at 28-30MPH about HALF the load on the drivetrain is from aerodynamic drag. And that is why lowering the drag will extend the range. 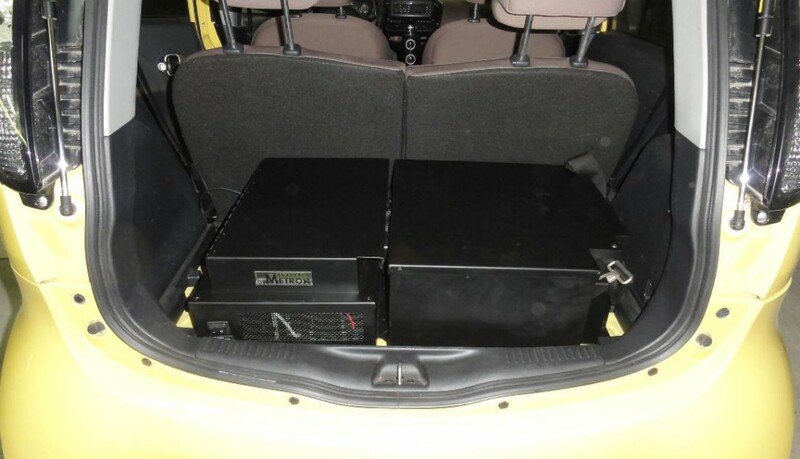 Range extender are two boxes (65kg together) that are placed and connected to a trunk, if needed. When you don't need RE, it can be easily taken out. Both batteries (main and added one) can be charged at the same time from two outlets. That's all I know for now. All additional infos will be available on earlier mentioned site. I hope I will have a chance to test it soon. My brother and my father each drive i MiEV's so maybe one (or) both of them will try some mods? I drive a Scion xA which has a stock Cd of 0.31. I used to average ~370 miles on a tank, but now I average ~490 miles. And I have had a handful of tanks well over 600 miles. So that is roughly 32% more range on average.